On January 20, the Flowers and Ornamental Plants Festival in 2019 was solemnly held in Phung Cong commune, Van Giang district to welcome the Certificate of the traditional flower and ornamental plant village of Phung Cong commune and inaugurate the model dike (hereinafter referred to as the Festival). The opening ceremony of the Festival witnessed the attendance of Mr. Do Tien Sy, Member of the Party Central Committee, Provincial Party Secretary, Head of the Provincial Delegation of National Assembly; Mr. Nguyen Van Phong, Deputy Party Secretary, Chairman of the Provincial People's Committee; Mr. Goshin Vladimir Anatolievich, Ambassador Extraordinary and Plenipotentiary of the Republic of Belarus to Vietnam and members of the Provincial Standing Committee. In 2018, flowers and ornamental plants in Van Giang district cover an area of over 1000ha. 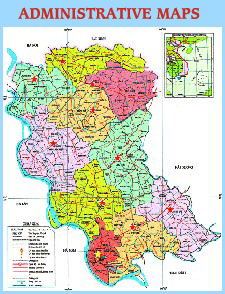 The district has formed the areas of flowers plantation, high-tech ornamental plants, decorative and construction trees in Xuan Quan, Phung Cong communes and Van Giang town; the areas of orange, kumquat, mandarin and pomelo in the communes of Lien Nghia, Me So, Thang Loi, Tan Tien and Van Giang town; the embryo area in the communes of Long Hung, Tan Tien, Nghia Tru and Vinh Khuc. In the district, there are 8 villages specializing in flowers and ornamental plants production, attracting over 5,000 households with over 13.5 thousand workers to participate in plantation, earning an income of nearly VND 800 billion. Up to now, the area of ​​high quality flowers accounts for over 17% of the total one in the district. The Flowers and Ornamental Plants Festival 2019 in Van Giang district includes more than 100 booths displaying flower and ornamental plant products of communes and town in the district, attracting hundreds of visitors to come and purchase. Over 11km of dyke at level 1 goes through Van Giang district. After nearly 3 years of implementing the emulation movement "Building the model dike" launched by the province, up to now, the violation of dike law in the district has been discovered and dealt with promptly. Some communes in the district have basically cultivated flowers and ornamental plants to create the environmental landscape and built a number of typical model dykes under the direction of the Provincial People's Committee. Speaking at the Festival, Chairman of the Provincial People's Committee Nguyen Van Phong praised the efforts, self-reliance and creativity of Van Giang people. At the same time, he affirmed the effectiveness of the restructuring of crops in the district, which has made an important contribution to creating jobs, improving the value of land use and ensuring local security after spending land for urban development ... He asked Van Giang district to continue creating favorable conditions for people to develop flowers and ornamental plants plantation associated with regional tourism development. At the ceremony, the delegates cut the ribbon to start the Van Giang district's Flowers and Ornamental Plants Festival 2019 and inaugurate the model dyke. On this occasion, Chairman of the Provincial People's Committee Nguyen Van Phong awarded the Certificate of traditional flowers and ornamental plants village to Phung Cong commune (Van Giang); many collectives and individuals with outstanding achievements in developing the job in the district were rewarded. According to the plan, Van Giang district's Flowers and Ornamental Plants Festival takes place from 19 to 21 January, 2019 in Phung Cong commune. The displaying area is maintained until the Lunar New Year 2019.